India launches South Asia Satellite - The Hindu, updated 4 mins ago. India has launched its GSAT-9, the South Asia Communication Satellite, from Sriharikota launch centre in coastal Andhra Pradesh on Friday evening. A 28-hour countdown began for the launch of the GSLV mission at 12.57 p.m. on Thursday, along with other pre-launch activities, Indian Space Research Organisation said. 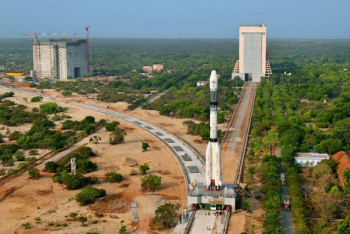 The rocket, labelled GSLV F09, is slated to put the 2,230-kg South Asia Satellite or GSAT-9 into space. The communication spacecraft to carry 12 Ku-band transponders that can drive telecommunication, disaster management, broadcasting and direct to home TV, Internet activities, tele-education and telemedicine across the region. First announced by the Prime Minister in July 2014 as a gift to India's neighbours and a positive diplomatic gesture, it was then conceived as SAARC satellite. After Pakistan declined to participate, it includes the rest of South Asian neighbours: Afghanistan, Bangladesh, Bhutan, The Maldives, Nepal and Sri Lanka. The Indian government bears the satellite cost of ₹235 crore and a roughly equivalent cost of launching it on the GSLV rocket to a distance about 36,000 km in space. This will be the fourth successive GSLV flight powered by the indigenous cryogenic stage, which ISRO developed over two decades. If whining, then entirely justified. GSLV launches have been relayed live in the past. The lack of countdown progress report on website, lack of launch brochure on website, lack of live telecast etc is grossly stupid. This launch after all has a huge publicity element attachment. But clearly our Prime Minister Narendra Modi was not proud enough to ensure that ISRO, which if memory serves is controlled by his office ie PMO, stuck to carrying out the usual information sharing such as posting brochure, countdown updates, live telecast etc. I look forward to the opposition parties like the Congress, SP, BJD, DMK, AGP, Communists etc. taking our Prime Minister to task on this fearful diffidence which has resulted in diluting this Indian taxpayer funded effort to curry favour in the South Asian region. No live telecast means we miss the SDRE countdown and running commentary..?? "THREEee, TOOOoo, WONNN.. + WONN, + TOOOoo....."
Keep hitting them outta the park ISRO! NASA is so confident of GSLV's success, that they published an article yesterdin, saying that the GSLV had launched the South Asia satellite. India launched its GSAT-9 communications satellite via a Geosynchronous Satellite Launch Vehicle (GSLV) rocket Friday. The Indian Space Research Organisation (ISRO) launch is aimed at supporting international partnerships in South Asia. The launch, which wasn’t shown live by ISRO, occurred at 16:57 local time (11:27 UTC). GSAT-9, also known as the South Asia Satellite, is a Ku-band broadcasting and telecommunications spacecraft which India has developed to provide services to members of the South Asian Association for Regional Cooperation (SAARC). What was the cost of this SAS and of the actual launch? All the leaders will take part & address the programme via video conferencing at 5.30 PM this evening. Successful launch of South Asian Satellite is a historic moment. It opens up new horizons of engagement. Before PM spoke, ISRO chairman briefed about the launch during which they showed​ a short video of the launch. Satellite ejecting from the bus is shown. Indeed, for a few seconds I was wondering what you were talking about. Then I recalled all the issues with prior GSLVs...years went by. Dont want to jinx it but I have come to expect 'parfarmans naamal' from GSLVs now. Seems like their root cause process is robust now. 400% lecture bazi going on. Hoping that GSLV Mk3 behaves itself well, and does not do any naughty things. Now, ISRO has high altitude testing facilities and its Cryo has been well tested. GSLV becomes the next PSLV. Wonder what shall happen to it? Anyway, congrats to all. DD had begun playing images around 5:20 pm. Guess the launch was kept so as our mandarins wanted to play the first visuals in front of videshi netas, which Mr Kiran Kumar did. Now wait for GSLV MkIII. but saar, it feels good to see India take the lead of hosting this event, and all saarc nations acknowledging it. With Modi being proactive about SAARC, it feels alive and kicking. Under UPA regime, it was "SAARC..who?" arun wrote: This launch after all has a huge publicity element attachment. I believe that may be the reason govt did not went for the live telecast. Although the possibility is very remote, Imagine the horrific PR it would have generated if it would have ended like GSLV F02. Its not the failure, but the Psuedo morons in the media must have given a lot of coverage to Pakistan....Pakistan..so by shutting it out, they also ensure that none unnecessarily got any specific coverage piggybacking on India's launch. The brochure came up late, though probably for good reasons,including the desire not to aggressively publicise the launch. Anyone know about these plasma thrusters on the GSLV? Are they all indigenous? In the GSLV D-3( the one that failed with the Indian CUS, on April 15/2010) of the four plasma thrusters on board, two were Indian, two were Russian supplied. What is the situation this time around? Gagan wrote: NASA is so confident of GSLV's success, that they published an article yesterdin, saying that the GSLV had launched the South Asia satellite. Actually they seem to have access to control room audio. There are minute by minute comments.